It is important to understand that AppSec skills are not a key requirement to become a security champion. The essential quality is to want to become one. I can make a good developer, who is interested and dedicated, into a good AppSec specialist in 6 months. 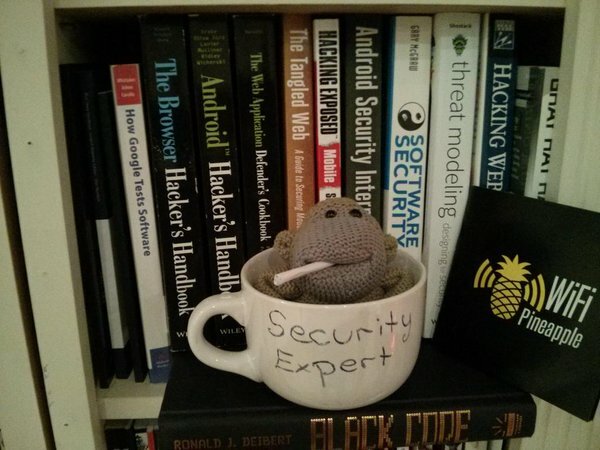 If the developer is an expert in AppSec, then he should join the central AppSec team. 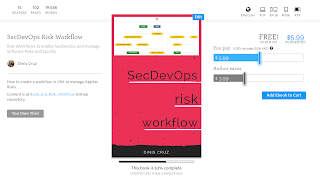 I just published version v0.63 of the SecDevOps Risk Workflow book. The diff for this version (with v0.60) shows 113 commits, 63 changed files, 667 additions and 185 deletions. We need AI to understand code and applications. Our code complexity is getting to a level that we need to start to use artificial intelligence capabilities to understand it, and to get a grasp of what is going on, so we can create secure applications that have no unintended side effects. As AI becomes much more commonplace, we should start to use it more to source code analysis and application analysis. Kevin Kelly has some very interesting analysis on the use of AI, where he discusses the idea that one of the next major revolutions will be where we start adding AI to everything, because the cost of AI will become so low that we will be able to add AI to many devices. One cause for this gap is the fact that a large number of DevOps teams come from network and infrastructure backgrounds, or network security backgrounds (i.e. traditional InfoSec), rather than from development (i.e. coding). Slides from presentation delivered at InfoSecWeek in London (Oct 2016) about making developers more productive, embedding security practices into the SDL and ensuring that security risks are accepted and understood. The focus is on the Dev part of SecDevOps, and on the challenges of creating Security Champions for all DevOps stages. This presentation is based on the ideas captured on the SecDevOps Risk Workflow book (that I'm currently writing). To try to capture my experiences, to help a wider audience and to get some feedback, I've been creating a book on leanpub called SecDevOps Risk Workflow which I would really appreciate if you could check it out. Annual reports should include sections on InfoSec and AppSec, which should list their respective activities, and provide very detailed information on what is going on. Most companies have Intel dashboards of vulnerabilities, which measure and map risk within the company. Companies should publish that data, because only when it is visible can you make the market work and reward companies. Obliging companies to publish security data will make them understand the need to invest, and the consequences of the pollution that happens when you have rented projects with crazy deadlines and inadequate resources, but somehow manage to deliver. A big blind spot in development is the idea that 100% code coverage is 'too much'. 100% or 99% code coverage isn't your summit (i.e. destination), 100% is base camp, the beginning of a journey that will allow you to do all sorts of other tests and analysis. The logic is that you use code coverage as an analysis tool, and as a way to understand what a particular application, method or code path is doing. Code coverage allows you to answer code related questions in much greater detail. The ability to run applications offline, i.e. without live dependencies of QA servers, or even live servers, is critical in the development process. That capability allows the developers to code at enormous speed, because usually the big delays and expensive calls are to those services that allow all sorts of versioning, and all sorts of development techniques to occur. The ability to run your apps offline also signifies that the application development environment has matured to a level where you now have, or have created, mocked versions of your dependencies. Ideally, the faster you can run the dependencies, even running them as real code, the better. The important thing is to be sure you are running them locally, without a network connection, and without an umbilical code to another system. As you read [the SecDevOps] book you will notice liberal references to the concept of RISK, especially when I discuss anything that has security or quality implications. The reason is I find that RISK is a sufficiently broad concept that can encompass issues of security or quality in a way that makes sense. I know that there are many, more formal definitions of RISK and all its sub-categories that could be used, but it is most important that in the real world we keep things simple, and avoid a proliferation of unnecessary terms. Fundamentally, my definition of RISK is based on the concept of 'behaviors' and 'side-effects of code' (whether intentional or not). The key is to map reality and what is possible. When opening issues focused on quality or security best practices (for example, a security assessment or a code review), it's better to keep them as small as possible. Ideally, these issues are placed on a separate bug-tracking project (like the Security RISK one), since they can cause problems for project managers who like to keep their bug count small. Since this type of information only exists while AppSec developers are looking at code, if the information isn't captured, it will be lost, either forever, or until that bug or issue becomes active. It is very important that you have a place to put all those small issues, examples, and changes. When you make a code change, it is fundamental that every change you make breaks a test, or breaks something. You are testing for that behaviour; you are testing for the particular action that you are changing. This means you should be happy when you make a change and the test fails, because you can draw confidence from knowing the side effects of the change. If you make a test change in one place and a couple of tests break, and you make another test change in a different place and fifty tests break, you get a far better sense of the impact of the changes that you made. When you look at the development world from a security angle, you learn very quickly that you need to look deeper than a developer normally does. You need to understand how things occur, how the black magic works, and how things happen 'under the hood'. This makes you a better developer. Studying in detail allows you to learn in an accelerated way. In a way, your brain does not learn well when it observes behaviour, but not cause. If you are only dealing with behaviour, you don't learn why something is happening, or the root causes of certain choices that were made in the app or the framework. When you create threat models per feature or per component, a key element is to start to chain them, i.e. create the connections between them. If you chain them in a sequence you will get a much better understanding of reality. You will be able to identify uber-vulnerabilities, or uber-threats, that are created by paths that exist from threat model, A to threat model B, to threat model C.
For example, I have seen threat models where one will say, "Oh, we get data from that over there. We trust their system, and they are supposed to have DOS protections, and they rate limit their requests". Many problems developer teams deal with arise from the inverted power structure of their working environment. The idea persists that the person managing the developers is the one who is ultimately in charge, responsible, and accountable. That idea is wrong, because sometimes the person best-equipped to make the key technological decisions, and the difficult decisions, is the developer, who works hands-on, writing and reading the code to make sure that everything is correct. A benefit of the 'Accept Risk' workflow, is that it pushes the responsibility to the ones that really matter. I've seen cases when upper-layers of management realise that they are not the ones that should be accepting that particular risk, since they are not the ones deciding on it. In theses cases usualy the decision comes down to the developers, who should use the opportunity to gain a bigger mandate to make the best decisions for the project. Sometimes, a perverse situation occurs where the managers are no longer coding. They may have been promoted in the past because they used to be great programmers, or for other reasons, but now they are out of touch with programming and they no longer understand how it works. Business needs to trust developer teams. Business needs to trust that developers want to do their best for their projects, and for their company. If business doesn't learn to trust its developer teams, problems will emerge, productivity will be affected and quality/security will suffer. A great way to show trust is to give the developer team a budget, and with it the power to spend money on things that will benefit the team. 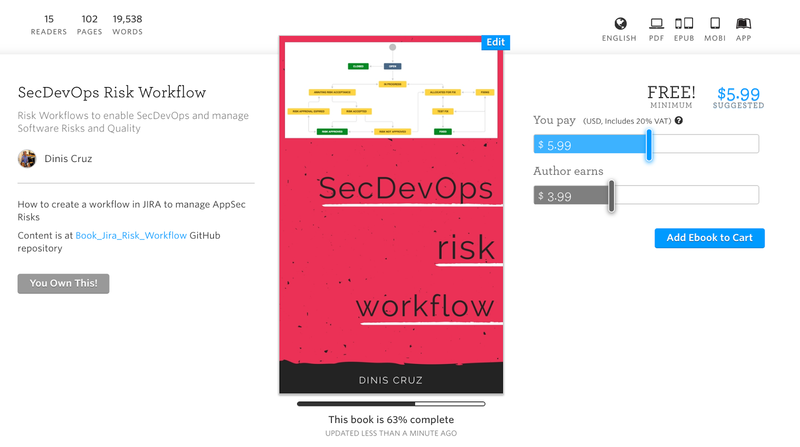 I just published version v0.60 of the SecDevOps Risk Workflow book. The diff for this version (with v0.57) shows 138 changed files, 459 additions and 174 deletions. Whether you are a developer or a security person, it is crucial that you link everything you do, to a location where somebody can just click on a link and hit it. Make sure whatever you do is hyperlinkable. This means that what you create is scalable, and it can be shared and found easily. It forms part of a workflow that is just about impossible, if you don't hyperlink your material. An email is a black box, a dump of data which is a wasted opportunity because once an email is sent, it is difficult to find the information again. Yes, it is still possible to create a mess when you start to link things, connect things, and generate all sorts of data, but you are playing a better game. You are on a path that makes it much easier in the medium term for somebody to come in, click on the link, and make sure it is improved. It is a much better model. When you write an application security test, you ask a question. Sometimes the tests you do don't work, but the tests that fail are as important as the tests that succeed. Firstly, they tell you that something isn't there today so you can check it for the future. Secondly, they tell you the coverage of what you do. These tests must pass, because they confirm that something is impossible. If you do a SQL injection test, in a particular page or field, or if you do an authorization test, and it doesn't work, you must capture that. If you try something, and a particular vulnerability or exploit isn't working, the fact that it doesn't work is a feature. The fact that it isn't exploitable today is something that you want to keep testing. Your test confirms that you are not vulnerable to that and that is a powerful piece of information. 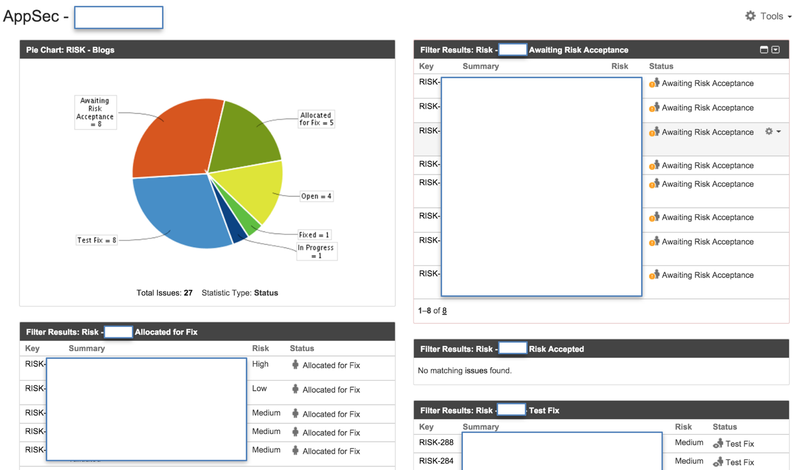 I just published version v0.57 of the (previously called) Jira Risk Workflow book. I hope you will agree that this change will represent better the direction of the book and the content I've been adding to it. Having an Board level mandate is very important since it sends a strong message of AppSec importance. The best way to provide a mandate to the existing AppSec team is to send a memo to the entire company, providing a vision for AppSec and re-enforcing its board-level visibility. Here is a variation of a memo that I wrote for a CTO (in a project where I was leading the AppSec efforts) which contains the key points to make. In lots of development teams, especially in agile teams, the backlog has become a huge black hole of issues and features that get thrown into it and disappear. It is a mixed bag of things we might want to do in the future, so we store them in the backlog. The job of the product backlog is to represent all the ideas that anyone in the application food chain has had about the product, the customer, and the sales team. The fact that these ideas are in the backlog means they aren’t priority tasks, but are still important enough that they are captured. Moving something into the backlog in this way, and identifying it as a future task, is a business decision. One of the interesting situations that occurs when we play the risk acceptance game at large organisations, is how we are able to find out exactly who is making business and technical decisions. Initially, when a ‘Risk Accepted’ request is made, what tends to happen is that the risk is pushed up the management chain, where each player pushes to their boss to accept risk. After all, what is at stake is who will take responsibility for that risk, and in some cases, who might be fired for it. Eventually there is a moment when a senior director (or even the CTO) resists accepting the risk and pushes it down. What he is saying at that moment in time, is that the decision to accept that particular risk, has to be made by someone else, who has been delegated (officially or implicitly) that responsibility. 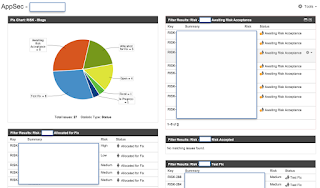 Visualising this data makes it real and creates powerful dashboards. These need to be provided to all players in the software development lifecycle. To expand the ideas I presented with Using JIRA to manage RISKS, I decided to create a smallish book focused on how that workflow works. Once you have a Security Champion (SC) program in place, you need to keep track of its effectiveness. Any other questions we should be asking? The AppSec team would like to conduct a survey about the Security Champion program. Once you've got your logs, a typical challenge is how to process, and visualise them. This usually happens when you try to address visualisation as a whole. But until good filters and multi-stage-analysis are in place, there is just too much data, too much information, and you will be left struggling with the sheer size of the data you are looking at. The key is to create an environment where we are only querying an subset of the data, with fast queries and REPL like workflow. One of the ways to manage this is to start with a small AppSec question (ideally codified as a Test). Here is how to review a pentest and figure out if it is a network security assessment or an AppSec security review. When you look at a pen test, you can tell very quickly if it was done by somebody who understands AppSec (somebody who can code), or by somebody who is approaching the problem from an network security point of view (usually running lots of tools). The first main points to notice are if they asked for the source code, and if they performed an threat model on the target application. If they didn't, then it is most likely going to be a network security assessment. One of the interesting questions that arose when we talk about the need for open-source security coding technology, security coding centres, and everything we need to build secure code is: Who pays for it? A very powerful design pattern that can provide a huge amount of security for web applications, is when there is no server-site generation of dynamic web content. The way to make this happen is to make all your web pages and content to be downloaded as static resources. This is done from a locked down server, ideally using git as the deploy mechanism. Data is provided to the UI via AJAX requests from dedicated WebServices. It is very important that security champions are given the time, the focus, the mandate and the information required to do their jobs. The good news is that now that you have security champions (at least one per team), their work will allow you to see the difference between the multiple teams and the parts of a company who are able to make it work, and those who are struggling make it happen. When we (AppSec) make a statement about a particular security issue, it always be clear and unambiguous. We should never say "This might be a problem", or "That might be exploited". When it comes to problems or weaknesses in AppSec, we have to express ourselves with confidence. InfoSec (Information Security) tends to have a really bad attitude towards end-users of technology and developers, where they (the users) get blamed for doing 'insecure stuff' and causing 'security incidents'. This is crazy, it is like health and safety officers complaining that people are 'doing things', so it puts them into danger. The fundamental logic is that security is there to empower users, not to be a tax or dictatorship. Let's be clear. If part of your InfoSec team you don't have a team of highly skilled professionals who understand AppSec (Application Security), who can program better than most of your developers, and who will be totally hireable by your dev team, then you don't have an AppSec team. If you work for a company that doesn’t have a strong AppSec team, or a company that has not seen powerful (or public) exploitation of their assets, you need to write some exploits. Never underestimate the power of a good exploit. A good exploit will dramatically change the business' and developer's perception of what security actually means to their company. One of the key elements of threat modeling is it's ability to highlight a variety of interesting issues and blind spots, in particular within the architecture of the threat model. One of my favorite moments occurs when the developers and the architects working on a threat model realize something that they hadn't noticed before.